The site has about 89 users daily, viewing on average 10.00 pages each. dailyreckoning.com Economic News and Ideas on Debt, the Market, Gold, Oil, and Investing. It is hosted by American Registry For Internet Numbers (Virginia, Chantilly,) using nginx/1 web server. 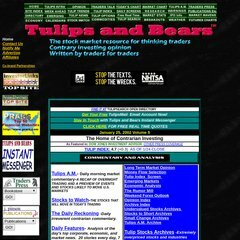 Its 2 nameservers are ns2.tulipsandbears.com, and ns1.tulipsandbears.com. Its IP Number is 74.122.192.150. PING www. (74.122.192.150) 56(84) bytes of data. A ping to the server is timed at 12.4 ms, and the average page load time is 3242 milliseconds.